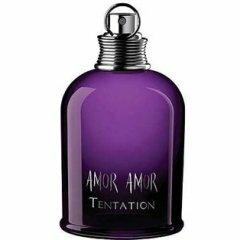 Amor Amor Tentation is a perfume by Cacharel for women and was released in 2008. The scent is floral-oriental. The production was apparently discontinued. While I love Cacharel as a fragrance house, I can't help feeling disappointed by its most recent perfumes. I loved the original Amor Amor and when I saw the advertisements for this fragrance I hoped for something unique, dark and slightly dusty like Lou Lou or Eden. While this fragrance is nice it is no where near being dark and mysterious. I didn't find this fragrance seducing me like it was supposed to. The scent is quite light, transparent almost. Amor Amor Tentation opens with the mandarin orange and a note that I believe may be plum. Sure it is rich and fruity, however it certainly isn't unusual. The ivy, tiare and jasmine notes are hardly strong enough to make any real emphasis and the musk makes its appearance far too early in my opinion. Overall, this fragrance was quite linear, I didn't sense much of a change from the top notes to the drydown. The only likable quality I found myself enjoying was the slightly smokey and musky drydown, however although the lasting strength is quite good the sillage is fairly poor meaning that I could hardly smell the drydown on my wrist at all, I really had to inhale deeply in order to smell anything. Write the first Review for Amor Amor Tentation!